The Royal Palace Museum in Laung Prabang (also known as “Haw Kham”) was once Laos' Royal Palace worth a visit especially if you are keen on the history of the city and the royal lineage. The museum houses a many interesting historical items. 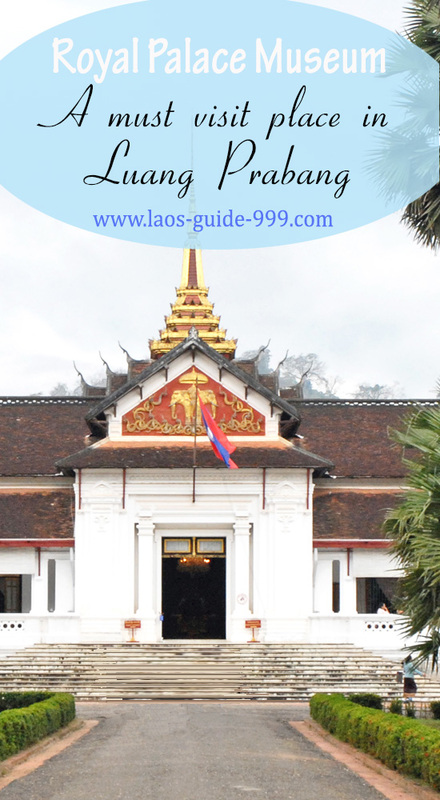 Every item tells a story...so you will learn quite a lot about Lao history and about Laos' royal. Built in 1904, it features a blend of Lao traditional and French style. It was built for King Sisavang Vong and his family during the French colonial era. After the death of King Sisavang Vong, the crown Prince Savang Vatthana and his family were the last to occupy the palace. After the revolution in 1975, the building was taken over by the government. The palace was then converted into a national museum and opened to the public in 1995. Located in the city just the other side of the road from Phou-Si mountain, the palace is in walking distance of all main hotels and guest houses. In the palace compound, there are several buildings including the Royal Barge Shelter, a conference hall, and Haw Pha Bang (a ornate pavilion) that houses the standing Buddha statue called Prabang. 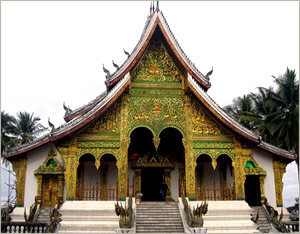 In the pass the Prabang statue and many other religious artifacts were housed in the palace, the front wing. Also in the compound is a building that houses the royal car collection. It's a small collection, mostly American cars from the 1950s to 1970s. Behind the garages is another building which has a gallery for rotating exhibitions. The palace building can be visualised in three main parts: The front wing, consisting of reception areas; the throne hall (in the middle); and the back wing that was once residential area. The King’s reception hall at the right of the entrance now displays busts and paintings of the Lao monarchy along with two large gilded and lacquered Ramayana screens. The walls of the room are decorated with murals depicting scenes of traditional Lao lifestyles, painted by a French artist back in the 1930s. The room next to the right of the King’s reception hall displays a collection of the palace’s most prized art including a cast of the prized Pha Bang Buddha statue in gold, silver and bronze. On the left of the entrance hall the former secretary’s reception area now houses gifts from various heads of state to the Lao monarchy. Displayed objects are grouped by “socialist” and “capitalist” countries. The room to the left of the secretary’s reception was once the Queen’s reception room. It now displays paintings of King Savang Vatthana, Queen Khamphoui and the crown Prince Vong Savang. Also displayed are friendship flags from China and Vietnam, and replicas of sculpture from the National Museum in New Delhi. The throne hall connects the reception wing with the residential wing where the royal family’s bedrooms and living quarter were. The walls of this room are decorated with cut mirrored tile mosaics similar to those seen in the town’s oldest temple, Wat Xieng Thong. Displayed in the throne hall are the throne of the king and queen, the king’s elephant chair and glass cases containing many crystal Buddha images that were removed from Wat That Makmo. 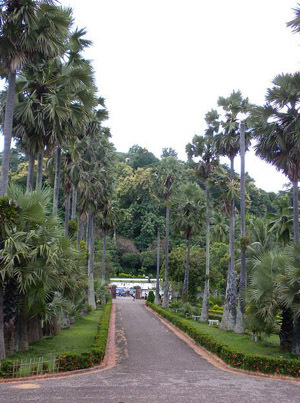 The back wing was the royals’ residential area and includes bedrooms, a dining room, a library and a music and dance exhibits area displaying Lao classical instruments and masks. The residential area has been preserved more or less as it was in 1975 before the royal family departed. Entry fee is 30,000 Kip (about US$4). Opening hours: 8.30am-11:30am, 1:30pm-4:00pm, closed on Tuesdays. Shoes must be removed before entering the museum. Dress conservatively. Women with short skirts or shorts are required to put on a Lao skirt before entering (Lao skirts are available for hire on spot). Tips: In Laos, staff tending places like this often don't give good enough instructions (if any at all) which sometimes leads to frustration. It may help save time and frustration getting into the royal palace museum by going in the following sequence. walk across to the museum, take off your shoes and deposit them at provided storage boxes before entering.